Med-inn boutique hotel in Bodrum - Güllük, one of Turkey´s finest boutique hotels, provides an exceptionally high level of quality service in a style that meets the needs of the discerning client in a romantic and tranquil setting ensuring a holiday to remember. Located directly on the beach with magnificent view of the bay, with amenities to suit all of your needs: set amongst natural beauty, providing fashionable suites, a relaxing atmosphere and friendly service. 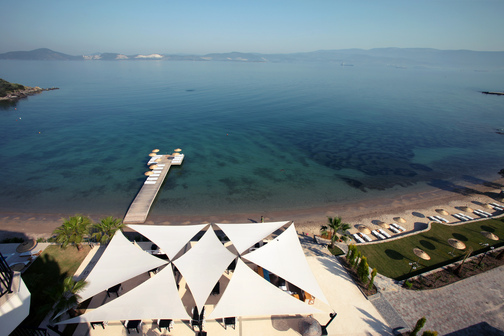 Relax on the beach, sunbathe next to the pool, or just sit and enjoy the garden terrace and bar area. Add to this a stylish contemporary interior with hippy-chic influences and you have the perfect ingredients for a carefree retreat. Med-inn boutique hotel Bodrum - Güllük is only 12 km from Bodrum Airport and 35 km from the lively and cosmopolitan centre of Bodrum. It is the ideal place for those who want to leave all the stresses of modern life behind. It’s a hotel with style, where peace and relaxation are considered a priority. Med-inn boutique hotel is far enough for solitude and close enough to have just as much civilization as you want.